Description: The main eye-catcher in the Great Church is the impressive Müller organ dating from 1738, which is the most depicted instrument in the world. It covers the whole west wall of the church and measures almost 30 metres from the ground. In the towering middle part the ‘werken’ (Rugwerk, Hoofdwerk en Bovenwerk), placed above each other, are clearly distinguishable; they are flanked on both sides with two enormous “pedal towers” in which pipes of almost 11 metres (32 feet) are placed. The organ is richly gilded and decorated with more than 25 larger than life-size statues, all made by Jan van Logteren, a sculptor from Amsterdam. The pinnacle is crowned with two lion figures holding the coat of arms of Haarlem. Soon after its completion the organ became a tourist attraction with international fame and it still is. It was played by G.F. Händel in 1740 and ’50, who travelled to Haarlem especially for this purpose, and in 1766 the ten-year-old Mozart was on the organ. In summer the city organ concerts attract many visitors each week. This flocking of the public is even more supported during the biennial International Organ Festival. 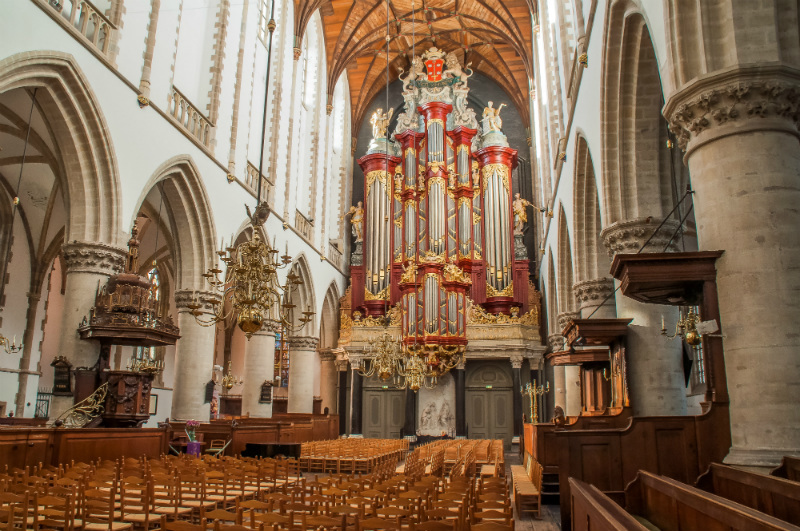 With the organ of Haarlem its maker, Christiaan Müller, a German by origin, has placed himself among the great organ builders not only of his time, but of all times.